This is a quarter vision glass jewelry display case. The glass display are of this display case is 12” high. This makes it easier to browse the items on display. Tempered glass is more durable and safer than standard glass. A halogen light strip ensures that the items on display are constantly visible. There are locking sliding doors that only grant access to the display area for authorized personnel. There is also a locking storage area to keep important items or paperwork in. The clear glass doors create a more open feeling in the display area. Available in all standard finishes and custom finishes upon request. 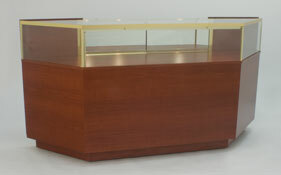 The two corners on this display case make it easy to create a custom display are by combining displays. It also works great as a standalone display case.